The cold that’s going around this season is intense. As of today, I’ve had it for two weeks. Between the coughing, congestion, and laryngitis, it’s been difficult to function. One wonders how our nineteenth century forbears managed in similar circumstances. Did they take to their beds and slowly succumb? Or were there plasters and potions to help them through it? In fact, Victorians had a multitude of (sometimes questionable) medicinals at their disposal. 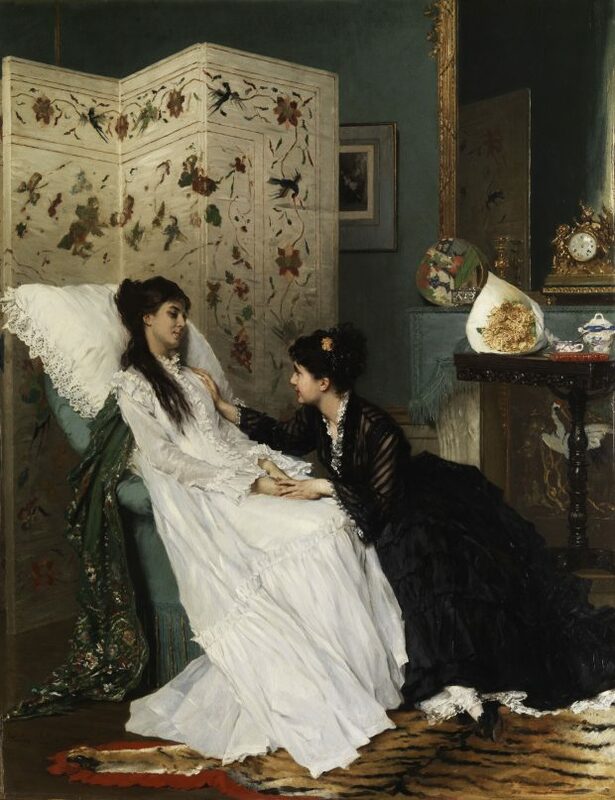 The Convalescent by Charles Baugniet, 1880. Later in the century, mustard plasters could be bought ready made in the form of mustard papers like Cooper’s Sinapine Tissue. Sold in packets at chemist’s shop, Cooper’s Sinapine Tissues claimed to be “far superior” to ordinary mustard plasters in that they were clean, portable, and never blistered the skin. Cassell’s Family Continental Handbook, 1872. 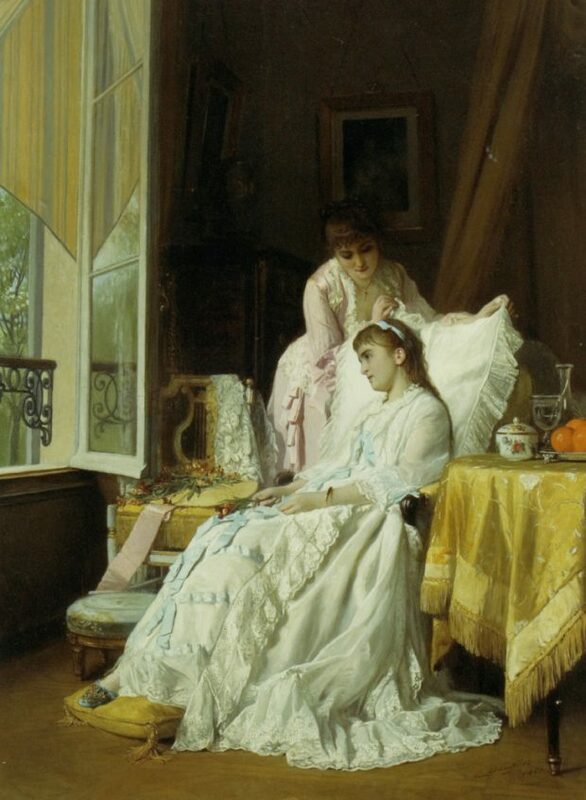 The Convalescent by Gustave Léonard de Jonghe (1829-1893), n.d.
Today, cough syrup with codeine has come to replace tinctures of belladonna and sniffs of chloroform, but as I write this—coughing and sniffling—I can’t say that we’re much better off than our nineteenth century ancestors. There’s still no reliable cure for the common cold. At least, not that I’ve found. What about you? Cassell’s Household Guide, Vol. 4. London: Cassell, Petter, and Galpin, 1869. Comfort, John. W. The Practice of Medicine on Thomsonian Principles. Philadelphia: Lindsay & Blakiston, 1853. 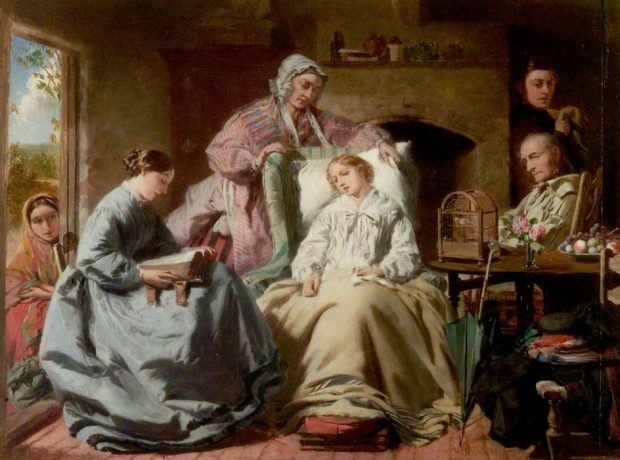 Family Physician: A Manual of Domestic Medicine. London: Cassell & Company, 1886. The International Medical Annual and Practitioner’s Index. New York: E. B. Treat, 1892. Moran, Francis John C. Cassell’s Family Continental Handbook. London: Cassell, Petter, and Galpin, 1872. Thomson, Spencer. A Dictionary of Domestic Medicine and Household Surgery. London: Groombridge and Sons, 1852. The Western Journal of Medicine and Surgery, Vol. 1. Louisville: Prentice & Weissinger, 1844. England, 1860. 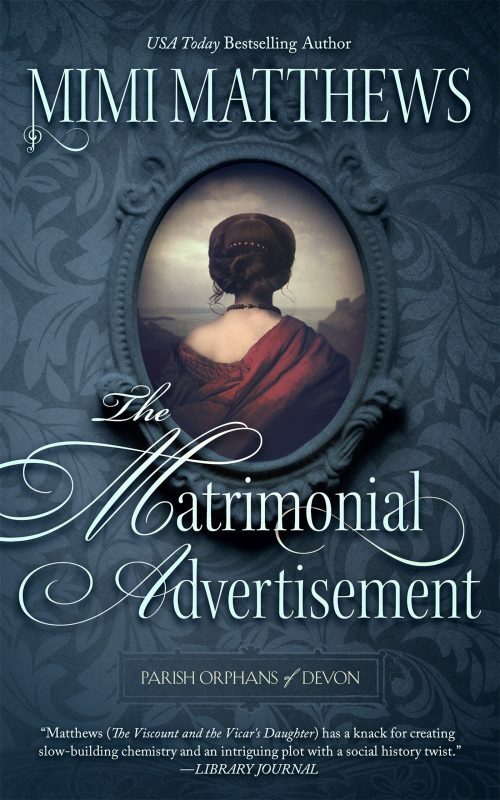 When ex-army captain Justin Thornhill places an advertisement for a wife, the mysterious lady who answers isn’t quite what he was expecting. Sorry you are under the weather. My 93 year old mother-in-law would set aside goose fat and plaster that on her son’s chest to break up the congestion. They claimed it worked, but I just couldn’t bring myself to try it! By the way, I just love the paintings you have included in this post. Hope you are feeling better soon! Gargling with warm salted water several times a day helps me. You need to tip your head back so it gets to the nasty germs at the back of your throat. Feel better! I remember my mother making an onion syrup when I was a child – there was no cooking, she poured sugar around the onion and left it. I don’t know how long she left it for, but the resulting syrup was rather nice in an odd sort of way. Until researching this post, I had no idea onion syrup was even a thing! Having been one of those kids prone to coughs and colds, I’m glad I didn’t grow up in the mustard plaster era.